But the goodness of God is foundational to the hope that He is working all things together for our good. The goodness of God is foundational to the hope that He is working all things together for our good. 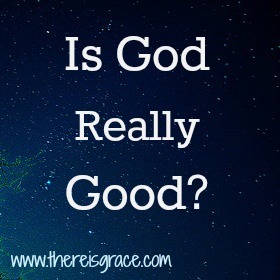 So, how can we determine whether God really is good? We cannot base our conclusion of God’s goodness on bad that happens in our world. Why? I’m glad you asked…. 1. We live in a fallen world. When Adam and Eve disobeyed God way back in the garden (Genesis 3), that opened the door to sin as well as sickness, disease, and death. The fact is, there is sickness in the world. There is disease. There is death. That is a result of man’s disobedience to God and rejection of His original plan. 2. There are consequences to our actions. Some situations we find ourselves in are simply a result of poor choices on our part. If I choose to eat poorly and refuse to exercise for most of my life, there will be dire consequences related to my health and general well-being. If I choose to show up late, do poor work, and cause trouble at my job, I likely won’t have that job for long. Not everything that happens to us is a result of our choices, but we do reap what we sow….in health, in relationships, in finances, and in life in general. 3. We cannot control the actions of others. If someone chooses to get behind the wheel of a vehicle while intoxicated, I cannot control the outcome of that situation or the effect it has on others. If someone chooses to detonate a bomb in a public venue, or open fire in a crowded building, I cannot control whether that choice affects me or others I know and love. So if we cannot determine the goodness of God based on the evidence in the world around us then how can we determine whether He really is good? Let’s look at what we know to be true…the Word of God. What does God’s Word say about himself? When Moses asked to view God’s glory, God’s reply was, “I will cause my goodness to pass before you” (Exodus 33:19)…not His power or His might, but His goodness. The Psalmist staked his confidence in the goodness of God: “I remain confident of this: I will see the goodness of the LORD in the land of the living” (Psalm 27:13). Peter reminds us that it is God’s goodness that calls us to knowledge of himself (2 Peter 1:3). We must be careful to not base our “interpretation” of God’s goodness on our current circumstances. If we do, we will be tempted to view our situation as hopeless. We must be careful to not base our “interpretation” of God’s goodness on our current circumstances. We must stake our hope on God’s word, and therefore on His goodness. Then it is easy to take Him at His Word….that He is good, and He does good. And He will do it for you. Want to read more on the goodness of God? Check out this fantastic article. and get a FREE set of 10 Scripture printables. It’s as easy as that! Don’t forget to follow us on Twitter and Pinterest, too! “We must be careful to not base our “interpretation” of God’s goodness on our current circumstances. If we do, we will be tempted to view our situation as hopeless.” Nancy this one sentence stood out to me because it is very true. Thankfully, God is faithful and His goodness is real…all the time. Thank you for sharing this at WJIM. Blessings to you. This is beautiful and so true. I came to know Jesus in 2008 and before this time, that question was one I often asked and no one could ever answer it for me! It’s so simple though – we live in a fallen world. Bad things happen. Thank you for this post! You are so welcome, Nicole. Thank you for stopping by. Thanks for linking up with Word Filled Wednesday! God bless! Such an excellent post, Nancy. As I’ve shared on my blog several times, I was taught from toddlerhood that God is good…but eight years ago our family faced a time of intense trauma in which I had to wrestle through “Do I really believe He is good as I’ve always been taught?” God was so faithful to give me a firm assurance that yes, no matter what things looked like on the surface, He truly IS good…and I am so thankful for that. Thank you for sharing your heart and God’s truth here!